Here we don't see that like a What If, it is a certainty. If you plot productivity against time, each Asian economy shows a similar thirty year arc. It grows fast, then growth picks up, then wages rise and then it falls. It happened for Japan, Korea, Taiwan, Hong Kong and Thailand. Malaysia is a bit more complicated, and neither the Philippines nor Indonesia have got going yet. China is difficult because the data are not so good. If you look at India, you see many many bottle necks. The state has committed itself to spend over US$ 1 trillion on such projects in the next five years, but most estimates do not see this even reversing the worsening problems. Transport and energy are the chief issues, along with rural modernisation. Some of this will be addressed with grand projects, such as the $12 billion Golden Quadrilateral project - 3,000 miles of six-lane highway connecting Mumbai, Delhi, Kolkata and Chennai. But big projects cannot solve all of the issues - the cities are becoming short of virtually all resources, really polluted and dreadfully congested. All of this can absorb huge sums to get right. Well, so that makes a lot of growth. It will all pay back in the end. Perhaps, but spending on a vast scale takes organisation, and it is very difficult to prevent corruption when everything has to be done in a hurry. And corruption there is! The entrepreneurial, "throw it all up in a hurry" model worked fine when things were on a small scale. Building fro the big scale is going to chew resources on projects that pay back over many decades. Growth is going to slow. Then you find that half of schools have no lavatories, and only a quarter have running water. Teaching is by rote - pupils learn a text and then repeat it for examinations. The OECD say that our schools are worse than they were 20 years ago, as measured by pupil abilities. A quarter of our population is illiterate. About 15% of primary pupils get to secondary schools and only half of those complete their education. Of that half, only 7% go on to tertiary education, where a quarter of all posts are vacant and only half of the 'professors' have a degree. I agree with both of the above posts. I think this What If is more like a Certainly Will Be. Let me go a bit further. The industrial countries are in a mess, and they are going to take a long time to dig themselves out of it. My guess is that there are going to be some significant political changes when they do so. Meanwhile, the emerging economies have really grown in tandem, through export led growth and not internal demand. The conditions that made early industrialisation move so quickly - limited regulation, low commodity prices, consensus - are not going to be there, either for new entrants or the existing EM economies. My What If is this. What If the entire world is necessarily set on a lower growth trajectory? There are two reasons for saying this. One, I have just discussed: the world is not green field any more, and it is hard to find high rent, low barrier projects, whoever you may be. Second, we are all going to have to spend a considerable amount of externalities It is as though fresh air has decided to levy a tax on us. If the "natural" growth in World product has been about 4.5%, it is not hard to see the first of these knocking a percent off and the second, one and a half. That leaves us with a number in the order of 2%, which is of course similar to overall birth rate. At 4.5%, the world of 2025 would be 77% richer than today; at 2%, only 30%. If one looks at these two overheads, both the organisational one and the externality one apply more strongly to poor populous nations that to the rich ones, which have internalised a lot this already. I'm not going to guess at more figures, but the impact must be greater per capita in these, as they anyway have higher birth rates. Another way of looking at this is that high costs and a degrading environment place major logs across the development road. So: What If it is clear in 2025 that we have moved into a regime in which growth will be permanently slower, and in which the poor nations do not really have a hope? I am extremely interested that maybe China will hit a problem. I see two ways that this may happen. They may both happen in parallel, of course. First, as has already been remarked here, China has industrial proletariat that fulfils every measure of Marx for solidarity. They know they are exploited; and they see major corruption in politics and state enterprises. I will come back to that. However, although unions are illegal in China, there exists the All China Federation of Trade Unions. According to this, workers' wages have shrunk as percent of GDP for 22 years since 1983. High growth is therefore required to create real income growth for the poorer worker, and China is slowing down. Sudden labour solidarity - and sharply increased wages - could sharply slow China's export economy to a halt. Exports will anyway be slower than has the case before the Western crash. But maybe it would stimulate internal demand? This I will come to later on. Now, I want to look at savings. People say that China saves a lot. There are two ways to look at this. First, there are no pensions, so you have to save. The One Child policy means that people are likely have nobody to look after them. That puts up savings rates. But what do you do with your savings? You get a few percent from bank deposits, but inflation is maybe double that, so your savings shrink. People now try to swap obligations rather than save cash, so I help you now and later you will get my son into university. Maybe you put them into property. I come back to property later, too. Second, though, although national saving rate was 36% of GDP in 1996 and grew to 51% in 2007, most of that came from the government and corporations and not by household. Since 2000, household saving rate stays around 20%. India saves more, at 24%. So, how do corporations do all this saving? Well, most of it comes from state enterprises. These are 30% of GDP and provide 20% of employment. (Of course, the rest comes from private companies - 70% of GDP and 80% of employment, including lots of farmers.) But state enterprises have monopoly power, they get cheap capital from people who are forced to save - like above - and get 'favours', so profits from two state enterprises (China Mobile and Petrol China) are greater than those from all top 500 private enterprise combined. Do they use investment well? Fitch report that return on capital in state enterprises is very low compared to private sector, and is half what it was before the 2007 crisis. So to get the same output growth they need about twice as much capital. If government wants to keep these organisations employing people, they are going to soak up more and more capital and maybe get unstable. Profit motive is less important for these organisations that state directives and personal advantages. All of the state is very corrupt, local government runs on bribes and the state companies even more corrupt. A few families are getting very rich indeed. World Bank estimates that corruption costs about 3% of GDP. That may not be large in comparison to many poor countries, but people have to bribe officials for every public service, from school places for their children to acquiring a driving licence or a hospital bed. Every permit comes with a bribe, every deal with a state company. In 2010, People's Bank of China did a study that was briefly on its website. This suggested that around 16,000 officials had moved $125 billion out of the country. Other studies suggest that over $50 billion a year is being taken out of China by officials in government and state enterprises. Surveys suggest that two thirds of wealthy Chinese are in the process of emigrating, or at least building themselves and overseas nest. An unverifiable Korean report says that 90% of the 300 members of the Party Central Committee have close family members living overseas or had acquired foreign citizenship themselves. The case of Bo Xilai, former Party controller of Chongqing, gives insight. His salary was $1,600 a month. His son went to British private school before taking degrees at Oxford and Harvard universities. His wife has accumulated a fortune of at least $126 million. The scandal prompted foreign investigation, suggesting that the families of President Hu Jintao, Premier Wen Jiabao, chairman of the National People's Congress Wu Bangguo, Vice-President Zeng Qinghong and Vice-President, Xi Jinping had all accumulated large sums, often held overseas. Bloomberg News showed that the relations of the last of these own interests in minerals, real estate and mobile-phone equipment that are together worth $400 million. Vice-President Xi is due to succeed to the Presidency at the end of the year. People know this stuff, and they face it every day. So, they do not see the country run for the people, but for the Party. They will put up with this so long as the middle classes do good enough and so long as the working people are kept quiet. If China gets bad disturbances from below, though, this is going to change because the two classes live right next to each other everywhere. Now, let me turn to construction, like I said above. Société Générale say that China spent more than $1 trn on construction in 2010, or 20% of GDP. Cement consumption was 55% of the whole world! That is 1.8 tonnes per capita, which is just the same as the Spanish boom and the Thai building bubble. In one year, 2010, China built as much floor space as exists in Spain altogether, 1.8 bn square metres. That is enough for 60 million people, which is three times the urbanisation rate, or a quarter of the population by 2015. That implies urbanisation rate of around 70%, which nobody expects until 2030 at least. So, we see empty phantom buildings now, and that is going to get worse if construction continues. But construction is the big employer for working class people in the city, so if it stops, we also see a problem. Now, I go back to the savings. As I said, people have to save, but nothing gives them a good return. So they pour it into building. Government also stimulates construction after the 2007 crisis. If construction does not give good returns, though, then they will have lost their savings. This is now a really big problem for government - do we go on building to keep people employed, and risk a big problem for the middle classes, or do we stop it and cause social trouble and maybe still lose money for the savers? This is real worry, and it is made worse by the very slow recovery in the rest of the world. Either way, one fifth of the economy and one quarter of employment - more in cities, of course - is in trouble. So, maybe China can switch its industry to support local demand? If workers wages rise quickly, they will be able to buy more. But export phase will have to close down. The real thing is, though, that people stay happy when the government seems to make things work and when they are getting richer. If there is a big crisis - maybe just switching hundreds of millions of people from one style to another, maybe property crash - then they may not stay happy. All nations depend on confidence, and every survey shows that China is a very confident country that looks forward to the future. But, those figures have been falling for five years. There is a point where confidence gets lost, and then we get into a state where bad gets worse. A simple extrapolation of nominal GDP growth rates has the aggregate of emerging economies ahead of the sum of the value added from old industrial economies by around 2015. If you do the same thing for domestic consumption, the date is 2020. Now, that could be derailed if China fails to develop, but it is not entirely dependent on China. There are two perhaps non-obvious reasons why this is interesting. First, it implies a global middle class that does not share the heritage of the West. It will have come fast out of nations with low institutional quality, and will have been won by both hard work and street-wise trading instincts. Trust will be low, the desire to keep power high. This is not a "caring, sharing" bunch, and Western models of probity and community spirit may well be tested. Second, the economic model on which things have tended to run is that the ultimate consumer is the West, and that the emerging economies are there to supply the goods. That is also untrue of the future, where it is plain that distinct markets will open up - indeed, have opened up - catering to this new consumer class. It is likely that low-income products aimed at the emerging markets will eat into Western markets as well. So what, precisely, is the West going to offer? Clearly, complex, "hard to do" sources of value added, and those where probity and trust have a role. Recipe: the West has to get hugely much smarter very quickly, and truly clean up its act. What happens to the less smart is an open question, but the passenger model is over for ever. Last point. 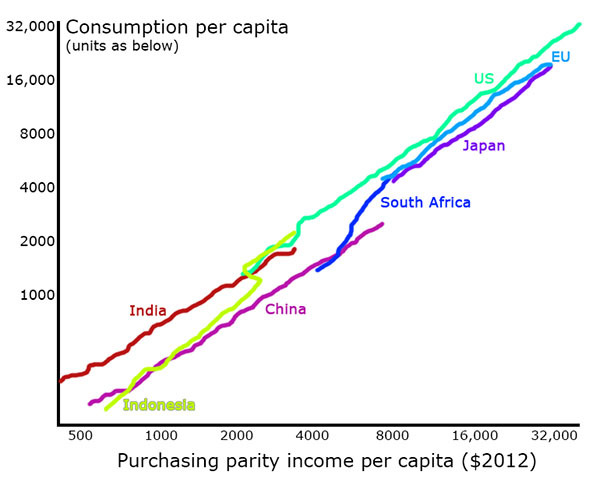 China is an under-consumer, as the figure shows. It is going to find exporting harder both as other producers come on stream - some sub-contacting to it - and as its own costs rise. It is therefore going to need to stimulate its internal market. In addition, its dependency ratio begins to rise in 2015, implying falling savings and rising consumption.